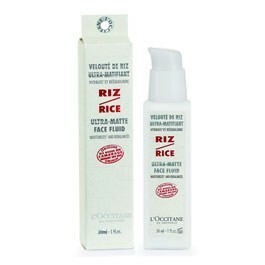 With an ultra light and velvety texture, this moisturiser is recommended for combination and oily skin. Enriched with rebalancing zinc and red rice extract from Camargue, as well as astringent red rice vinegar and mattifying powdered red rice, it leaves skin pure and mattified. Tolerance dermatologically tested. This product is free from: parabens, phenyol alcohol, animal ingredients, synthetic colorants, formol or formaldehyde, No triclosan, BHA, BHT, EDTA. Aqua/water - glycerin**- dicaprylyl carbonate**- methyl methacrylate crosspolymer - cyclomethicone - red rice vinegar*- oryza qativa (rice) extract**- oryza sativa (rice)**- oryza sativa (rice) powder**- citrus medica limonum (lemon) peel oil**- butylene glycol - maltodextrin**- cetearyl alcohol**- sorbitan stearate**- ethylhexylglycerin - zinc glycyrrhetinate - spiraea ulmaria extract**- cetearyl glucoside**- zinc pca - salicylic acid - sodium hydroxyde - hydroxyethylcellulose**- c13-14 isoparaffin - parfum/fragrance - chlorphenesin - acrylates/c10-30 alkyl acrylate crosspolymer - propylene glycol - polysorbate 60**- laureth-7**- tetrasodium glutamate diacetate - peg-20 methyl glucose sesquistearate**- polyacryamide - phenoxyethanol - sodium benzoate - potassium sorbate - limonene**- coumarin. This lotion is gorgeous,really light but not too runny. It smells amazing and feels really refreshing on your skin. It melts in really quickly leaving your skin feeling really refreshed and moisturised but also leaves it looking more mattified than usual without comprimising the moisturisation. It is a pleasure to use and worth every penny. I really loved using this fluid, it does make the face look more matte and leaves skin nice and soft without drying out the skin. Wonderful concept and formula, total must. If you can see yourself paying this much for a good cream then do so, personally, I would use it on rare occasions to make it last longer. "This lotion is gorgeous,really light but not too runny. It smells amazing and feels really refreshing on your skin. It melts in really quickly leaving..."